Today I'm going to discuss a very highly requested post on how I maintain my weight and wellness. To be honest I'm a big eater and I eat a lot but as I grow older I started noticing I don't eat as much as I was younger its not like I don't want to but my body seems to reject it. So since then I try my best to have a healthy and balanced diet daily. In order to have a proper proportion of weight and body I believe it takes a constant effort and work into our daily lifestyle. Our daily lifestyle and consumption play a huge role in determining how our body will look and feel. There's no use to have a body that looks great on the outside but feels weak on the inside. One should be able to maintain and manage their daily lifestyle in order to make sure they have a balanced lifestyle. As for myself I might inherit my mom's gene of not being able to gain so much weight but I do still get fats on my tummy or bloated tummy when I kinda messed up my eating pattern. Just a little brief introduction on my body's state I used to experience a mild gastric problem that makes me feel super weak and I just can't function properly. Ever since I decided to always keep up with my eating pattern and not to miss meals. Before I wasn't on any serious diet to loose weight as well but as someone who's quite perfectionist I tend to forget eating when I get busy with work, thus I end up screwing up my own body. So after I made sure to eat, when many people fear of gaining weight I fear of not eating properly and harm my body again. That's why I also bring some snack around with me just incase I end up busy and having no time to eat I still have something to munch. Now I'll introduce you tone of my current favorite snack from Heavenly Blush, its their ready to drink yogurt mixed with fruits and their snack bar. Heavenly Blush yogurts are made and designed in a way that makes them ergonomic to carry around and eat on the go. Their Greek Yogurt which is currently their main highlighted product is said to be able to make us feel full longer thus one will not have to eat too much. This is because of their denser and thicker texture of their yogurt which contains less water level thus it can help us to feel full much longer. However coming from someone who don't really like liquid yogurt before, Heavenly Blush has changed my mind completely. Before I'm more of a fan of Fro-Yo (frozen yogurt) I would say I prefer their ready to drink yogurt with fruits extract in them compared to their Greek Yogurt. Heavenly Blush Greek yogurt is perfect to mix in your granola or acai bowl that's why I prefer eating them that way instead of just the yogurt. However drinking it just as it is, isn't that bad too! They've made the packaging design very innovative and handy for traveling with straws that can extracted longer. Their Hi-Fiber yummy snack bar is also something really great to hold on your hunger because the snack bar comes in different layers of fruits, oats and multigrain that are rich and high in fibers. All these tips might look simple and you can most probably find it everywhere but if you follow them you'll see definite change in your wellness which will eventually effect your body. When it comes to diet I don't mean starving and not eating or following up with all the diet food plan which is popular these days but to eat right and to have a balanced diet with everything you need in a meal from carbohydrate, protein, fiber, vegetables and fruits. Yogurt is very good for the body as they contain high fiber and lots of good bacteria needed by the body to maintain a healthy digestive system. As I've said previously I used to only like fro-yo and before I'm a loyal Heavenly Blush fan too when they still serve fro-yo. But now since I was introduced to their ready-to- drink yogurt (yogurto) I'm a total fan now! Heavenly Blush yogurt tastes so good and they also has the right taste. They have a wide variety of ready to consume yogurt in different flavors with the right sourness and nutritionally balanced. Heavenly blush yogurt has great taste and doesn't contain preservative, artificial coloring and artificial sweetener. Basically now everywhere I go I will pack at least their snack bar with me and consume their ready to drink yogurt after meal. I like to treat it as a dessert and It's so refreshing when served cold from the fridge. I make sure to always follow with my meal plan daily and on every breakfast, lunch and dinner I would never skip rice. This plan may not work for everyone but since I rarely do snacking so rice is all I need to keep my body functioning. Whenever I finish my heavy meals I would rarely go and eat snacks like chips etc... However on cheat days I love some sweet cupcakes and cakes as well cause I'm a sweet tooth by heart! But since I'm breaking out and my skin condition hasn't improved much I've decided to cut on my sugar intake. After continuously following my meal plan and adding Heavenly Blush yogurt into my meal plan. I feel my body feels a lot cleaner and my digestive system seems to work properly as well and I rarely experience constipation anymore after incorporating Heavenly Blush yogurt everyday into my meal plan for about more than 2 weeks now. 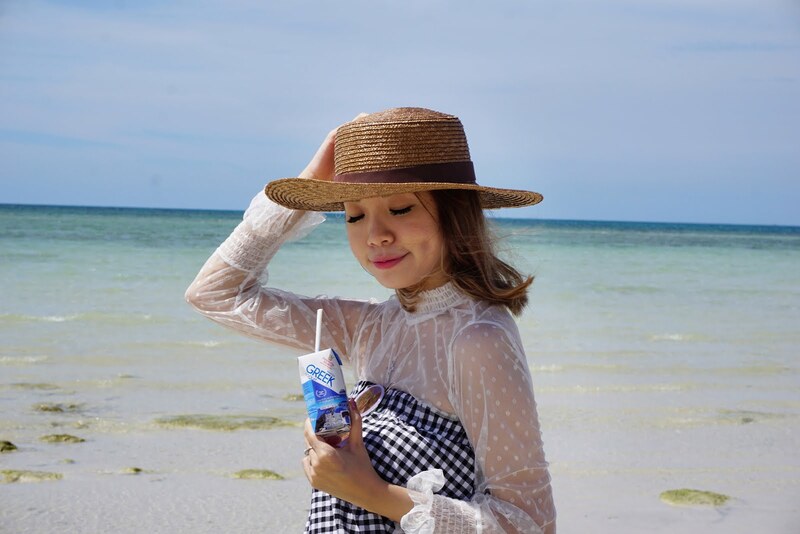 The high fiber concentration in Heavenly Blush snack bar and yogurt health to regulate my metabolism thus resulting my body to feel so much lighter and healthier compared to before. After consuming Heavenly Blush yogurt daily I also feel my acne that are active and red come less inflamed even though they don't just disappear in a puff~ I've been actively combating acne for the longest time but a healthy balance diet is something I believe play a huge role in clearing up my skin too cause I believe when your body feels good it'll show on the outside. To be honest I would rarely go on exercise or workouts but consider this my workout hacks, I love to go on long walks whether its evening by the park or by the mall. I can go through each floor from one end to another end and keep going back and forth. This is my way to get myself moving. Although in a mall its air conditioned and it would be hard to perspire but my main objective is to get myself moving that's why before in a huge mall where there's three cinemas I would go to the other end to eat and watch movies at the cinema on the opposite side of the building. Some may find this ridiculous and bothersome but this is just my way to walk a few miles further. I enjoy long walk but sadly here in Jakarta there aren't many pedestrian walks and considering safety it is hard to walk around but when I'm overseas I try to make the most out of it by going on long walks. I prefer exploring the neighborhood on foot instead of taking public transport if its only 1 or 2 km away. So if I'm in town I try to move around the malls whenever I visit this is my kind of hassle free workout. No, my main goal isn't to lose weight but to have a proper ideal body which makes me feel and look good about myself. Sometimes its not about how other people see that matters but how you feel about yourself is the most important. I guess I will continuous to keep drinking Heavenly Blush yogurt regularly. Hope my little insights and tips can help you achieve your desired ideal body. No matter your size or shape but as long as you feel happy and healthy you're beautiful! You know your own body and only you can judge how you should manage your diet. But always remember to eat right and not over eat! I believe balance is key to everything. Btw guys Heavenly Blush is currently also hosting a competition to take 30 winners to discover the secret of Greek wellness and health to Greece. Experience, travel and enjoy the beautiful Greek and Santorini with Heavenly Blush. For more information regarding this competition check out Heavenly Blush #HeavenlyBlushGreekSecret, Make sure you don't miss out!